The city launched a new program on Thursday morning to provide clean streets and jobs to residents. Under the program, 12 commercial corridors in all six wards will be cleaned every other day (including on weekends) from mid-August to the end of September. 24 Paterson residents will be provided part-time jobs through the program. “This is not just an opportunity for a cleaner and safer city, it’s also an opportunity for employment for Patersonians,” said mayor Andre Sayegh in announcing the program on the steps of the historic Danforth Memorial Library. Sayegh said the part-time workers will make $14.42 per hour, 67-percent higher than the current New Jersey minimum wage of $8.60. A dozen people gathered in front of the library, attracted by the curious sight of a press conference. “I just got out of jail can ya help me get a job?” yelled Delores Robinson from the sidewalk. “Where do you sign up for these jobs?” shouted Ozzie Stewart. The small crowd was told information on how to apply for the jobs is available inside the library. Sayegh said a job posting is also available on the city’s website. Hector Rivera entered the library after the press conference. He was provided a flyer. He was running home to get his resume to apply for the job, he said. Those without resume will find assistance at the library to create one, said the library director. “I’m going to go pick up my resume now and will return in an hour,” said Rivera. He lives near Main and Slater Streets. Rivera, who is presently unemployed, said he made $10 an hour working at a warehouse. “It’s great,” he said of the $14.42 rate. Previous criminal records will not be a disqualifying factor in the hiring process, said municipal officials. The mayor said employees will work 20 hours per week. He said there will be two shifts: 8 a.m. to 2 p.m. and 2 p.m. to 8 p.m. Employees will clean-up sidewalks of debris, pull weeds, maintain planters and trash receptacles, and remove outdated flyers and advertisements from utility poles. The employees will also alert public works to pick up overfilled receptacles. Each employee will be provided cleaning materials and supplies like brooms and bags. They’ll receive uniform t-shirts and hats. Trash filled bags will be picked up by public works on a daily basis. The program is being funded through a grant the Paterson Urban Enterprise Zone (UEZ) secured from the state. The program budget is $298,000, said Penni Forestieri, director of the Paterson Urban Enterprise Zone. Forestieri said the funds will allow her to run three sessions. In other words, after the first session ends in September, she will be able to initiate a second session in spring. And a third session in the summer. “A clean environment is incredibly important to our business owners, residents, and visitors. This program provides income to Paterson residents to help address this high priority while also helping business owners attract new customers. 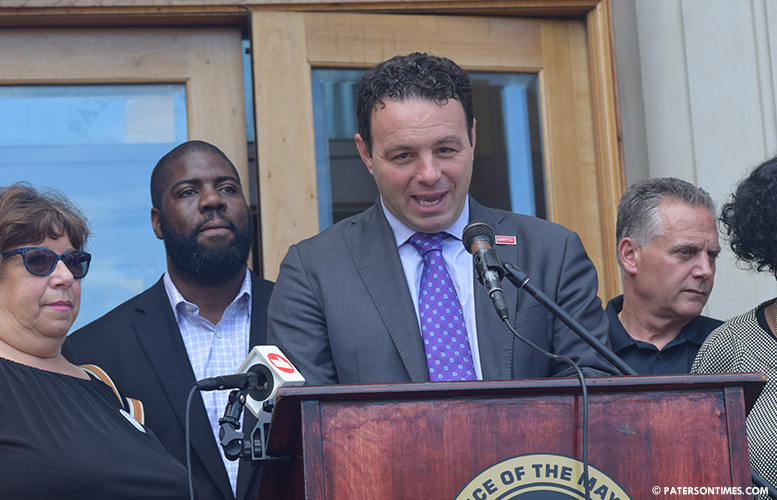 It’s a win-win-win for Paterson,” said Sayegh. 1st Ward: Grand Street from Spruce to Spring Street; Main Street from Memorial Drive to Broadway. 2nd Ward: Union Avenue from Redwood to Paterson Avenue; Totowa Avenue from Sheridan to Preakness Avenue. 3rd Ward: River Street from 6th to 1st Avenue. 3rd Avenue from East 19th Street to McLean Boulevard. 4th Ward: Broadway from Auburn Street to East 22nd Street; 10th Avenue from Madison Avenue to East 28th Street. 5th Ward: Market Street from Madison Avenue to Straight Street; Park Avenue from Madison Avenue to Straight Street. 6th Ward: 21st Avenue from Madison Avenue to Summer Street; Main Street from Crooks to Bloomfield Avenue. PLEASEEEEE……The first thing PATERSON'S NEW MAJOR should do is FIX THE FREAKIN STREETS and stop THE FREAKIN EXCUSES….OR WHAT ARE THESE POLITICIANS DOING WITH THE FREAKIN TAXES?? ?….When we enter in PATERSON we all know because of the FREAKIN POT-HOLES ALL OVER and NOBODY GIVE A CRAP……STOP THE EXCUSES AND FIX ALL THE FREAKIN STREETS….!!!!!!!! !